What should I do if I notice account activity that's not mine? What should I do if I got a suspicious email, text or phone call? What choices do I have to limit direct marketing contact and sharing my information? What information is covered by your privacy notices and why do you collect information about me? What should I do if I notice account activity that's not mine? If you notice activity on your account indicating a transaction made by someone other than you or an authorized user of that account, call us immediately at 800.432.1000. You’re protected by Bank of America’s $0 Liability Guarantee: Fraudulent transactions made using Bank of America credit and debit cards are covered by our $0 Liability Guarantee as long as you report them promptly; please visit our account and card security page for additional details. The Identity Theft Resource Center layer, a nonprofit for U.S. consumers, offers step-by-step instructions, form letters and other resources for theft resolution. You may want to file a complaint with the Federal Trade Commission layer (FTC) and a police report, depending on the level of fraud. You can also request credit monitoring services or a credit freeze from the credit bureaus. What should I do if I got a suspicious email, text or phone call? Bank of America is committed to keeping you informed about ways you can easily confirm that you’re on the real Bank of America website or mobile app and that you’re receiving authentic emails and texts from Bank of America. Bank of America will never ask you to provide your Social Security number, ATM or debit card PIN or any other sensitive information in response to an email. 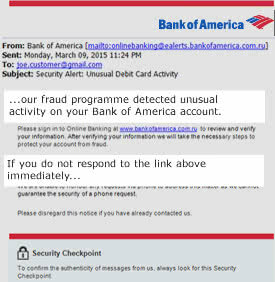 If you receive a suspicious call, text or email from someone claiming to be Bank of America, do not respond and do not click links or open/download attachments. Instead, send it to abuse@bankofamerica.com and delete it. If you did provide personal or financial information, contact us immediately at 800.432.1000. Be sure to include any relevant details, such as whether the suspicious caller attempted to impersonate Bank of America and whether any personal or financial information was provided to the suspicious caller. For more information about email fraud, view our FAQs about recognizing fraud. What choices do I have to limit direct marketing contact and sharing my information? What information is covered by your privacy notices and why do you collect information about me? Our privacy notices apply to personally identifiable information about a client or a client's current or former relationship with Bank of America that is not publicly available. We collect and use various types of personal information for our everyday business purposes, for example: to process transactions, service and maintain accounts, comply with laws and regulations and better respond to your needs. Personal information does not include aggregated or de-identified data that we may create or compile from various sources, including accounts and transactions. This information, which does not identify individual clients, is used for business purposes which may include offering products or services, research, marketing, analyzing market trends and other purposes consistent with applicable laws. What is McAfee LiveSafe™? What is Trusteer Rapport™? What is SafePass®? What is ShopSafe®? McAfee LiveSafe™ proactively helps prevent computers from getting or maintaining a malware infection. Bank of America offers McAfee LiveSafe™ free to our clients for 12 months. Sign in to Online Banking or enroll in Online Banking to take advantage of this special offer. ShopSafe® is a free service you can use when you shop online if you have a Bank of America Visa or Mastercard account. Temporary credit card and CVV numbers are generated so your card number remains completely private and protected. Plus, merchants can charge only the amount you authorize. ...our fraud programme detected unusual activity on your Bank of America account.